If you would like to see our Google Reviews – Click here and find our star ratings under our Google business profile. Here is an example of of testimonials I found online and was able to share – Thank you to these wonderful people for taking the time to give us a star rating! To see our nocowboys.co.nz Reviews – Click here – we are very appreciative of people leaving us these testimonials and feedback. To see our Linked In Recommendations – Click here and scroll down – you will need to be a member of linked in to see the individual testimonials. If you would like to see our star ratings on Facebook – Click here. Speaking of good testimonials, We have won two People’s Choice Awards as Best Audio Visual Provider in 2010 and 2012 from the Corporate Events Guide when it was around. We were sad when the corporate event’s guide disappeared in 2013, they provided a good service linking businesses with team building, functions, entertainment and product launch providers! 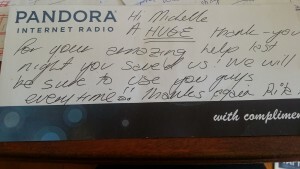 What better testimonials than hand written thank you notes? If you would like to send us testimonials feel free to email them through and we’ll add them to the page. We booked The Rock Factory for our charity ball in September and they were incredible. They were far and away the best value we could find (even with other companies saying they were doing us a sponsorship deal!) and nothing was too hard for them on the night. It went perfectly and above all else, they are simply very kind and happy people. I would recommend them to anyone who wants professionalism, value for money and real people. Feel free to contact me for a reference or testimonials. The Rock Factory are awesome! They have made both my albums which have both got radio play based on their skills as engineers. They have done my live sound at shows in and out of Auckland city. Both the owners Mark and Michelle have featured on a series of radio shows of mine “The Muso Show” on Kiwi FM where they try to educate musicians on how to do a better job of recording/ promoting and managing themselves. Mark and Michelle are both hardworking but also a real pleasure to deal with in the music industry. Consistent, affordable, and easy to work with – we’ve been using the RockFactory for a few years now and they’re so reliable and easy. Michelle is better than she gives herself credit for…extremely talented musician, engineer and producer all wrapped up in a small, friendly, happy, patient & pretty package! the best thing about recording with michelle @ the rock factory is the relaxed atmosphere and the fact she treats you like a friend and shows a genuine interest in your music and really takes on board what you are trying to achieve. michelle & mark have tons and i mean TONS of recording, producing, mixing and live sound experience! check them out..you will not regret it. The Devonport BIG Spring Jam wouldn’t have been the same without The Rock Factory on board. Michelle and Mark supplied all the gear that was needed including front of house and pack in/pack out. I’m not too flash on the technical side of things so it was fabulous that they just got on and did it, no questions asked. That’s exactly what you need when organising an event! I would highly recommend Michelle and Mark from The Rock Factory for ANY events, big or small. They are fantastic to deal with..even with helping me make the ultimate weather call! I will definately be using The Rock Factory again for my future events. Cars, bikes, booze, and one hell of a setup from The Rock Factory. Mark definitely made our little garage setup sound and LOOK like a miniature vector arena. Keep in mind that Mark is VERY professional and real easy to deal with, and thats exactly what you want. The perfect attitude for stressful events haha. We will definitely be using them again… and again! Being in a band can be really expensive at times. The costs of gear, practice, recording, transport and even gigging all adds up at the end of the day. It’s good having people like Mark and Michelle and The Rock Factory making things like live sound, lighting, PA hirage and recording affordable for us little guys. In our short career as a band they have provided us with live sound mixing, PA hirage and mixing for a performance on national TV, live recording, lighting and equipment hirage and most recently a live recording of one of our performances. Every time we have dealt with them they have been extremely affordable as well as highly professional, friendly and supportive. Personally I appreciate Mark and Michelle for their support of the local music scene and would recommend them to anyone in need of sound or production services. Thank you for making our performances so much more special. Just wanted to say a big thank you for all your help and hard work leading up to and on Saturday/early hours of Sunday morning! It was an intense show with 5 bands and all of them sounchecking but I trusted Mark to deliver and he totally did. All the backline hire was a real help too and was great to not have to change between all the bands! Coming from a live sound background, I am always somewhat hesitant of trying out new people as live sound is definitely something that cannot go wrong if a gig is to work, but I am more than happy to use you guys again and recommend everyone else to also. You guys are very accommodating and go out of your way to help out, something not all sound companies will do for you. Thanks for making the show a success for us and hope to work with you guys again very soon. As a band, we’ve now recorded 3 times with Michelle at the Rock Factory over a period of about 6 months. Over this time we’ve recorded songs we’re really proud to call our own and it has a lot to do with the way Michelle works. We feel like our ideas are taken seriously and understood well, and with her expertise we really feel like we were able to achieve what we set out to do with our recordings. A really good working relationship has been established, and we appreciate the fact that we can trust the Rock Factory to capture our sound well. THANKS TO YOU AND YOUR GORGEOUS RECORDINGS we have the chance to go to the national final as part of the top 6! thanks so much for everything you did for us the other night! Dan and Myself were up till 430am Friday morning editing the footage and syncing the soundtrack with it. HEY MICHELLE WE ALL WOULD LIKE TO THANK YOU AND MARK FOR GIVING UP YOUR SPARE TIME TO DO OUR LITTLE RECORDING PROJECT AND WE ALL ARE STOKED WITH END RESULT. CANT WAIT TO GET BACK INTO YOUR GUYS STUDIO TO DO MORE!!! THANKS HEAPS, THE SILLY BOYS!!! 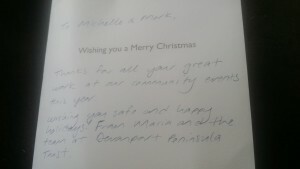 Thanks heaps Michelle! Always a pleasure playing when you’re on sound cause we can be confident it’s gonna sound good out front 😀 see you again soon no doubt! thanks for giving us such awesome sound at the noisy stage at camp. That bass drum sounded the best we’ve ever had! great sound as usual by the rock factory!!! Hey Michelle thanks for doing our sound on Saturday, it sounded great. Most likely we’ll be seeing you at another show, not sure when though. Thanks alot michelle! We were all really happy with the sound. Hopefully we will do many shows together. And i love the sound you guys get out of a drum kit! Just wanted to say what an amazing job you guys did with sound. So much great feedback from other churches that were there on the night. For bands out there looking for great live sound .. …LOOK NO FURTHER. These guys are GREAT! We’ll see you again most definitely will highly recommend you to anyone looking for best sound. God Bless. Just wanted to say thanks for all the help and support you guys have given us since day one. Nowhere else would you be able to find nicer people with the set of skills you both possess. We definately wouldn’t be here if it wasn’t for you guys!